Shrimp Creole is an easy, classic entrée with fresh briny shrimp cooked in a spicy sauce made with tomatoes, spices, and the holy trinity. 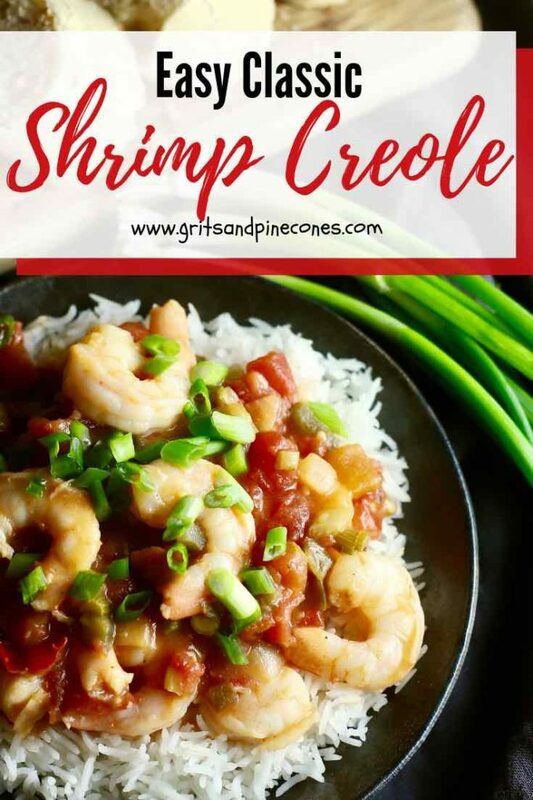 * This Shrimp Creole recipe is perfect to serve at a Mardi Gras party, a quick weeknight family dinner, or a casual dinner with friends. *What is the holy trinity? 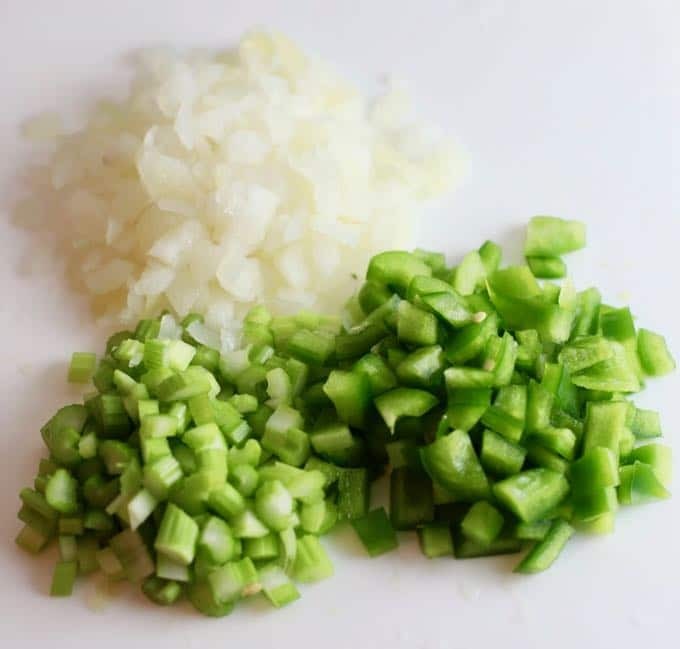 The holy trinity, in Cajun and Creole cooking, consists of onions, bell peppers, and celery. 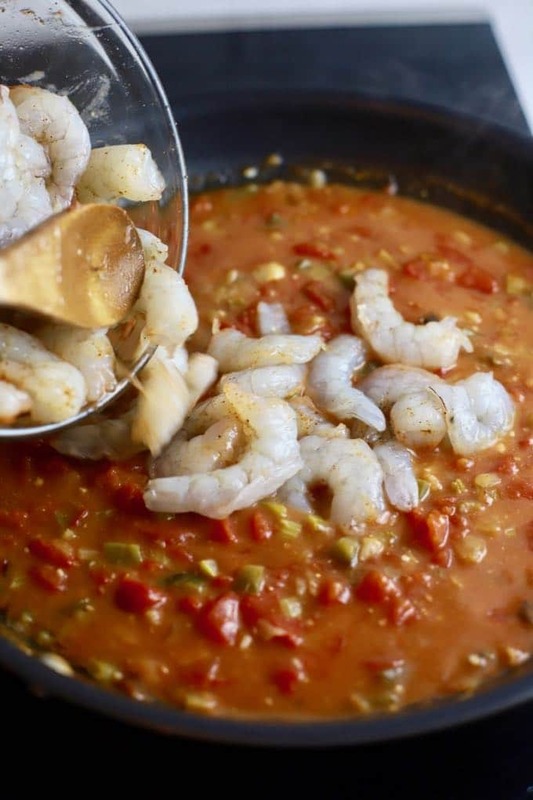 In Louisiana, every cook has their own recipe for Shrimp Creole, and all include shrimp and the holy trinity. My sister, Chula at the Pudge Factor Blog, shared this recipe with me and I don’t think you will find an easier or more delicious recipe! In case you are wondering, Shrimp Creole has a tomato-based sauce, while Shrimp Étouffée and Shrimp Gumbo have roux-based sauces. A roux is a fat (usually butter or cooking oil) and flour, in equal amounts, cooked together and used to thicken sauces. A white roux or béchamel sauce cooks in just a few minutes and is used to make sauces. Cooking the roux for a few more minutes results in a blonde roux. A blonde roux is usually used to thicken stock-based sauces, gravies, and stews. A brown or caramel-color roux takes 20 to 30 minutes of cooking to achieve its deep brown color. Creole and Cajun cooks use this type of roux with its rich, nutty flavor and aroma, for gumbos and ètouffée. 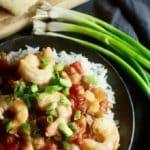 What to serve with Shrimp Creole? I serve Shrimp Creole over white rice and with a nice loaf of crusty French bread. It’s a stand-alone main dish and doesn’t need any side dishes. If you like Creole or Cajun recipes, or are looking for a few recipes to celebrate Mardi Gras, you are in the right place. Check out these popular recipes on my blog: Easy Chicken and Sausage Jambalaya, Mardi Gras Hot Muffaletta Dip, Mardi Gras Snack Mix, Creamy Shrimp Creole, Southern BBQ Shrimp and Cheese Grits, and for dessert, Old Fashioned Pecan Pralines. Oh, and don’t forget you will need a Hurricane Cocktail to wash everything down! Melt butter in a large skillet over medium heat. 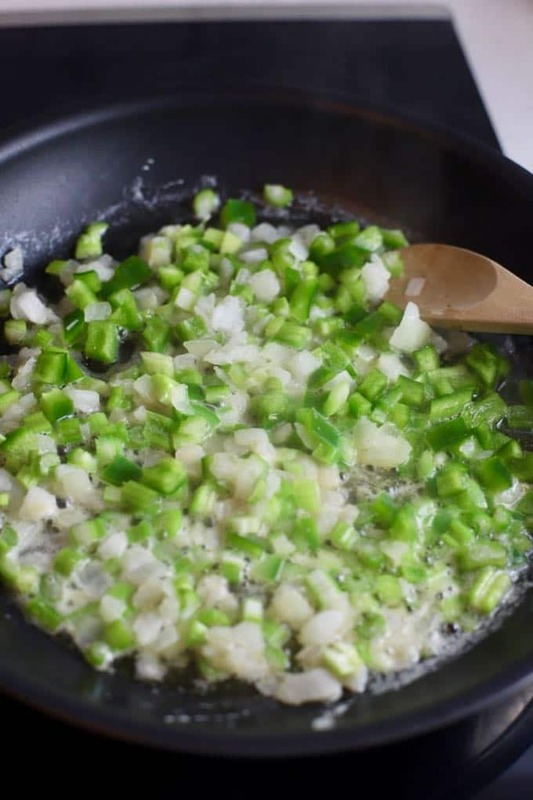 Add the onions, celery, and green pepper. Sauté and stir for about 10 minutes or until the vegetables begin to soften. Add garlic, and cook for 30 seconds, or until fragrant. Add salt, sugar, cayenne pepper, and flour; stir to combine. Add diced tomatoes with juice, chicken broth, Worcestershire sauce, and hot sauce. Bring the mixture to a boil; reduce heat, cover pan and let simmer for 30 minutes, or until the vegetables are tender. While the tomato sauce simmers, add the Creole seasoning to the shrimp and toss to combine. Also, this is a good time to prepare your rice according to the directions on the package. Add the shrimp to the tomato mixture. Stir and cook for about 3-4 minutes or just until the shrimp are cooked through. 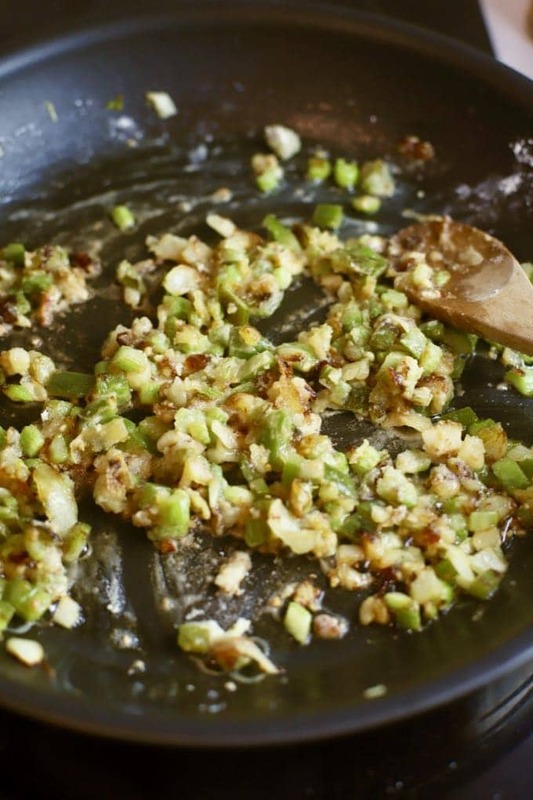 Serve with white rice and, if desired, garnish with the chopped green onion tops. Shrimp cook very quickly and will be tough if overcooked. Shrimp are done when the exterior is pink, the flesh is slightly opaque, and they form a loose “C.” Wait to add the shrimp until everything else for your meal is ready. They will continue cooking in the sauce and go from cooked to overcooked in a matter of minutes. If they form a tight “C,” they are overcooked. 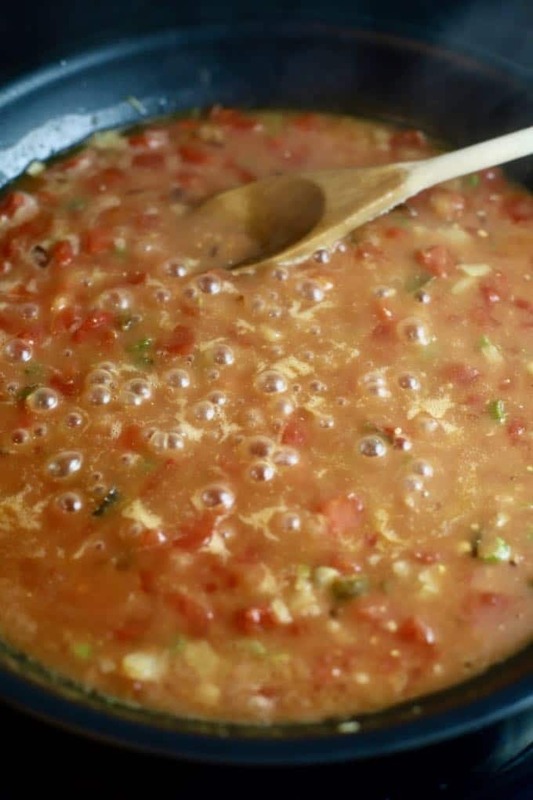 To make Shrimp Creole ahead, make the tomato mixture as directed. Allow to cool and refrigerate covered for up to 24 hours. Before serving, bring the tomato mixture to a low boil over medium heat and add the shrimp. Cook the shrimp as directed. You can substitute olive oil for the butter. Shrimp Creole is an easy, classic entrée with fresh briny shrimp cooked in a spicy sauce made with tomatoes, spices, and the holy trinity. 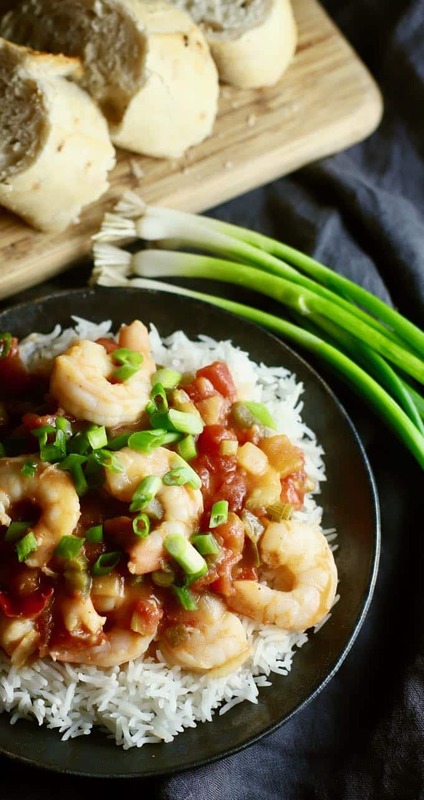 Shrimp Creole is perfect to serve at a Mardi Gras party, a quick weeknight family dinner, or a casual dinner with friends. While the tomato sauce simmers, add the Creole seasoning to the shrimp and toss to combine. Also, this is a good time to cook your rice. Serve with white rice and if desired garnish with the chopped green onion tops. Shrimp cook very quickly and will be tough if overcooked. Shrimp are done when the exterior is pink, the flesh is slightly opaque, and they form a loose "C". Wait to add the shrimp when everything else for your meal is ready. They will continue cooking in the sauce and go from cooked to overcooked in a matter of minutes. If they form a tight "C", they are overcooked.